It may seem that Chickens are less worry in Summer than in Winter, but through my experiences, I tend to disagree with that statement. It could be that because we find life less entertaining and harder to live through the winter month's, we assume it's the same for every other creature. Sure, Chickens probably don't like the cold and prefer warmth - and that's where I think the answer lays - warmth, not heat. I would say there's a lot more chance of a Chicken overheating during Summer than a Chicken getting cold during Winter. Their feathers are natural insulators. We have a natural desire to plonk their Houses in the middle of a Lawn. During Summer, they are far happier scratching around the bottoms of Hedges and Bushes. They are Jungle Fowl, not grassland creatures. Putting the House and Pen nearer a hedge and producing some shade will give them a much more comfortable environment. I'm sure you will find that if you let them run free, they will spend more time in the Bushes than on the Lawn. If you can't move their Home, ensure the Pen is partly covered. If you shut your Hen House at night and it's a bit confined, see there's ample air getting in and around. A sign of chickens feeling the heat is when they kind of squat and raise both their wings up in the air. It looks like they're practising take off, but they're just doing the same as us and 'clearing the armpits' a bit ! 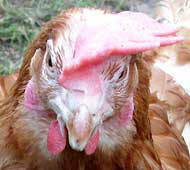 For more information on this, please visit the 'Where to site a Chicken Coop Page'. 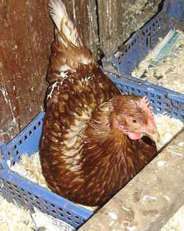 I've covered most of this in the Broody Hen page, but it can be extremely worrying when they go broody in hot weather. They tend to just stay in the Nest Box all day and this can cause de-hydration. It's best to lift the Chicken out and make sure she gets some water, food and a spot of fresh air. If you are out all day during hot spells, try and build a separate shelter for them outside and basically fence them in. If you simply shut the Hen House door, this will lead to the others bullying her. Either ways, make sure the Hen has ample water. There's nothing a chicken loves more than a good dust bath on warm dry soil. They will spend hours simply laying there with just the occasional flick of a wing, usually ensuring that everything within a radius of about four feet is covered with a nice thick film of dirt! Most of the human chores during Summer are much easier than Winter. Cleaning of the Hen House is only about a third of the work compared to Winter. However, hot weather does bring about Mite problems, so a good inspection of the Homes little nooks, crannies and the end of Perches is needed. If they are present, buy a good, eco-friendly and safe Powder to sprinkle in the necessary places. Popping into your local Farm Suppliers and reading the back of these is a good idea. In Summer, plastic Houses are better and they don't produce a lot of Mites and other creepy crawlies. Over the years I have lost more Chickens during the Summer than Winter, I would guess the percentage would be about 75%, but it seems that heat is not such a good healer as we think. Maybe? Nothing like a good Bath ! If getting ex-battery hens through the summer month's, bear in mind they are often pretty much featherless and will feel the heat too much making their backs sore.